We've closed the curtain on the Munchkin Shakespeare Kickstarter, and are recovering from a month of running the campaign. But while we rest on our laurels, we wanted to give credit where credit is due; to our backers. We ended with 5,280 backers, for a grand total of $295,109! Thank you for the amazing outpouring of support, not only through helping to fund the game, but sharing our social-media posts, spreading the word on your own, and just commenting with your feedback. You are the reason this project not only met, but exceeded, the goals we set for it. 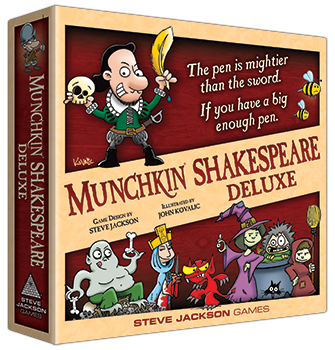 This makes Munchkin Shakespeare into a Deluxe set, and unlocked every available card, plus so many accessories and add-ons that even Henry IV would be jealous. Thank you all so, so much. Munchkin Shakespeare began its life on a cruise ship, as a mere brainstorm for a booster pack, and has grown to so much more. Andrew, Steve, John, and the entire production team have been able to take these humble beginnings and not only create a full fledged Deluxe set, but also an expansion, and a ton of accessories and bonuses. I'd like to propose a round of applause for all of the creative and production staff on the project, without whom none of this would be possible. And someone, please get John an ice pack for his drawing hand. He's turning in some amazing art at a breakneck pace. Fortunately, a couple of guest pieces by Lar DeSouza may help lighten the load a bit. If you missed out, fear not! Once the funds have been collected and Kickstarter has taken their cut, we'll be getting a BackerKit survey out to all of our backers to complete the pledge, add extra stuff, and more. When that happens, we'll be opening preorders through BackerKit to get some of the Kickstarter loot, until the survey closes. And if you still can't do that, Munchkin Shakespeare Deluxe will be going to retailers later this year, so you can get it at your friendly local game store! Speaking of (and to) retailers, if you're interested in ordering the game and other Kickstarter items, just email our Retail Liaison and we'll get you that information. But the end is never really the end, is it? There's always an encore! While our team is at GAMA Trade Show next week in Las Vegas, we'll host a live stream from our penthouse suite, on March 15. Yes, you know what that is . . . So join us for our Ides of March Kickstarter wrap-up with Andrew Hackard and John Kovalic over on Facebook on March 15. Post your Munchkin Shakespeare questions on Facebook or Twitter with the hashtag #SJGamesLive and we'll pick the best ones to answer live on air!